Dear Zindagi Review: Check Dear Zindagi Review starring Shah Rukh Khan and Alia Bhatt in Lead Role. The will release tomorrow in India, but the preview show took place yesterday along with the US released on 23rd November 2016. The movie has got an enormously positive response from the Film Industry, all the actors who watched the movie have shared their thought about the movie which creates more curiosity about the film. But is the film a Must Watch? Is the movie cool? To get the answers to such questions, read the Dear Zindagi Review down. Dear Zindagi is directed by English-Vinglish Fame Gauri Shinde and casts King of Bollywood Shah Rukh Khan, Alia Bhatt and Kunal Kapoor in Lead roles. Amit Trivedi has composed the music of the movie while the film is produced by Dharma Productions and Red Chillies Entertainment. Dear Zindagi is the story of Kiara played by Alia Bhatt, a rising cinematographer who is in search of a perfect life. She meets Jug played by Shahrukh, who is an unconventional thinker. Jug helps her to gain new perspective on her life. She find that hapiness is all about finding comfort in life’s imperfections. Please share your reviews about Dear Zindagi Movie as comments down. Dear Zindagi is produced by Actor-Producer Shah Rukh himself along with Karan Johar’s Dharma Production. The movie stars Alia Bhatt and Kunal Kapoor with Shah Rukh in an additional role. The film got UA certificate from the Censor board, and it has the Two hours 30-minutes running time. Writer & Director: Gauri Shinde. Producer: Production company: Dharma Productions, Red Chillies Entertainment, Hope Productions. The film revolves around the heartbreaks that Kaira, Alia’s character goes through. Starring Ali Zafar, Kunal Kapoor and Angad Bedi as the three guys who enter Kaira’s life only to give her heartbreak. The film finally brings her to therapist Jug played by Shah Rukh Khan. Dear Zindagi revolves around Alia Bhatt and she is very good at her role. Shah Rukh Khan as Jug has played an extended cameo role which managed to impress the viewers. Ira Dubey, Ali Zafar, Kunal Kapoor and Angad Bedi are there in other supporting roles. Music of the film is composed by Amit Trivedi with lyrics written by Kausar Munir. All songs of the movie are heart touching. The title track ‘Dear Zindagi’ song are the most favorite songs now while the music lovers still love others songs. The music suits perfectly with the plot of the movie. Gauri Shinde directed movie is a must watch for everyone. 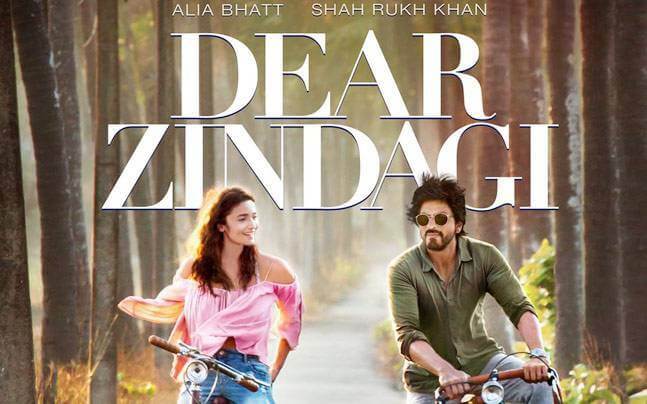 Shah Rukh and Alia Bhatt have performed pretty well in the film, and our rating for this film is four stars. The Kiss: Amazing Plot, Alia’s and Shah Rukh’s Performance. The Slap: Not a Masala movie, At some place, pace of the movie is slow. Dear Zindagi movie is about life and how to face your life. My Rating for Dear Zindagi is 4 Stars.